It’s Independence day in the US, and I wanted to send everyone a special 4th of July greeting in honor of this great annual event. Last night, as sundown approached, the skies near me were full of vintage WWII planes flying in formation – a salute to this great country and to the people who gave their lives to defend and protect it in so many countless ways and over such a long period of time since our founding fathers first proclaimed our independence and our freedom in 1776. They, and everyone who came after them pledged their lives, their sacred honor, and their personal wealth to declare and to defend the declaration that henceforth this would be one nation, indivisible, under God, with liberty and justice for all. Every day since we’ve faced challenges from without and from within, but in spite it all, the work to constantly defend, to protect, and to perfect the dreams embodied in that declaration have continued without faltering. Each generation in turn has had to face the challenges of its time and to make the sacrifices required to preserve for themselves and for their progeny all that the promise of America could offer to a people who would be free. Today we celebrate and renew our pledge and our continued resolve to support, protect and to defend that dream which has become America. Millions have risked all to come here and to be a part of this great undertaking. Many more will make that same commitment in the future, and all in the hope that the dream will never die and the promise of hope and freedom will be passed on to our children and to their children and for all eternity. Let us each renew our pledge to do our part, as all who came before us have done, and to renew today our commitment to fixing what is wrong, to bandaging and healing the wounds; and let us pledge all that we are capable of to make the future the brightest we have ever known, and the harbinger of even greater things to come. Today I salute all those who came before us and who passed on to us the greatest legacy they could give – hope, promise, and a solid rock to build upon. Included in the gifts which we received, they left a reminder and a monument which has stood as a symbol of all that this great country could offer – a monument to liberty. 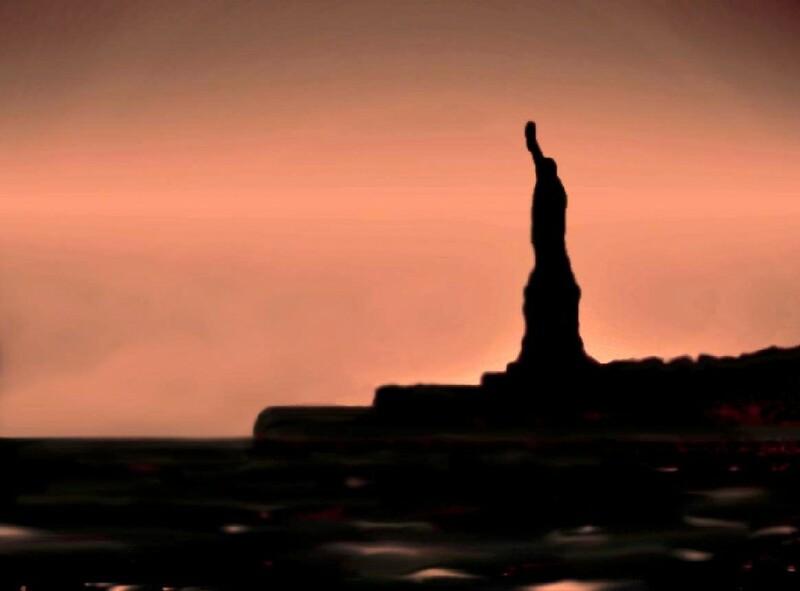 As an artist, I want to share an image from a photograph I made which I think will speak to freedom loving people everywhere, as it has spoken to so many before, and to whom it was possibly the first welcoming sight of their future in liberty as they approached our shores for the first time. Here is my visual reminder of who we are and what we stand for. I hope it will speak to you, as well. With the dawn of every new day, she reminds us or our heritage – Liberty for All. Wishing you a great Independence Day July 4, 2012! This entry was posted in Uncategorized and tagged America, declaration, freedom, heritage, independence, July 4, legacy, liberty, pledge, statue by Jim. Bookmark the permalink.